On the evening of July 14, 1921, as the production on Lotus Blossom was nearing completion, a "Motion Picture Electrical Pageant" was held in downtown Los Angeles with an estimated crowd of 300,000 lining the streets. The pageant was a very public film industry showcase and numerous film studios and leaders such as Universal, Hal Roach, Louis B. Mayer, and the Selig Zoo (located next to Eastlake Park in Lincoln Heights) among many others, were represented by “electric floats,” each equipped with small generators and lights to illuminate the float displays. 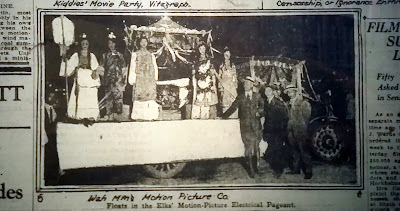 The Wah Ming Motion Picture Company also participated with a float showcasing their first production. 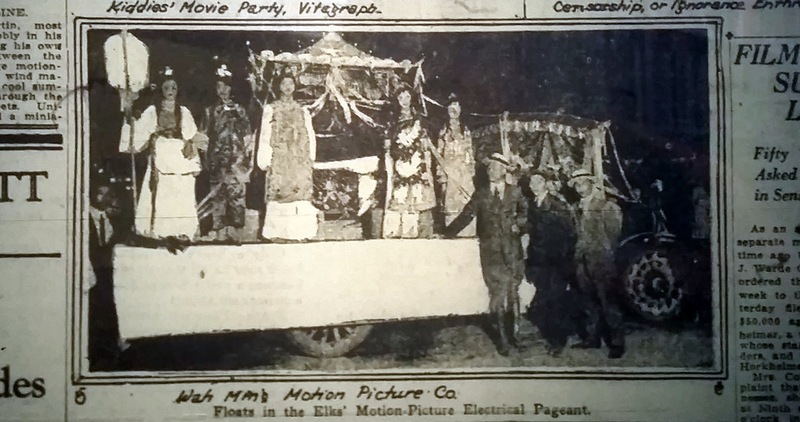 The producers of Lotus Blossom might have seen this opportunity as a real publicity coup for their upcoming film, as a photo of the float was only one of a handful of images that was included in the Los Angeles Times July 15 article. The entire comment about the Lotus Blossom float in the Los Angeles Times: “Chinese players produced a “Lotus Blossom” float with many oriental men and maids in native costume. The production was by the Wah Ming Motion Picture Company.” Los Angeles Times, 15 July 1921, Los Angeles Central Public Library. On July 18, the Times published a story based on a reporter's visit to the Lotus Blossom set, mentioning that it was “operating at the old mansion on Boyle Heights.” Though a supportive article, it was marred by an ugly attempt at humor with several racist cartoon sketches of some of the Chinese crew members, replete with “pigeon-English” dialogue. The inclusion of these caricatures in a major newspaper only underscored producer James B. Leong's point that Chinese Americans themselves needed to actively counter these kinds of degrading images. The article also described a brief meeting on the set with cinema’s “first Chinese film star” (national exhibitors advertised her as “the screen's first and only Chinese star”), Lady Tsen Mei, who played the self-sacrificing young heroine, Moy Tai. By this time, the actress had starred in one film, 1918s For the Freedom of the East, and was a well-known performer on the vaudeville circuit, often billed as the “Chinese Nightingale.” Her most noted role is in the first film version of W. Somerset Maugham's The Letter (1929), her third and final movie. She was also widely admired for her sophisticated background, noted in many of her current biographies today. For example, she was said to have been born to a noble family in China, then emigrated to America as a child, obtained a law degree from Columbia, and briefly attended medical school before studying at a prestigious music school in New York. However, according to Scott D. Seligman's well-researched book, Three Tough Chinamen, Lady Tsen Mei was actually born Josephine Chong in Philadelphia in 1888, the biracial child of Chinese immigrant, Moy Shoo Chong, and his mulatto wife, Jessie Whitehurst. At twenty-one months she was adopted by another local biracial couple, Chinese physician Jin Fuey Moy and his Delaware-born white wife. Josephine began her career as Lady Tsen Mai in vaudeville at age 24 and by all accounts was a multi-talented performer as a singer, actress and “voice mimic.” It appears she retired from show business by the late 1920s, though she lived almost a century, dying in Norfolk, Virginia in 1985. 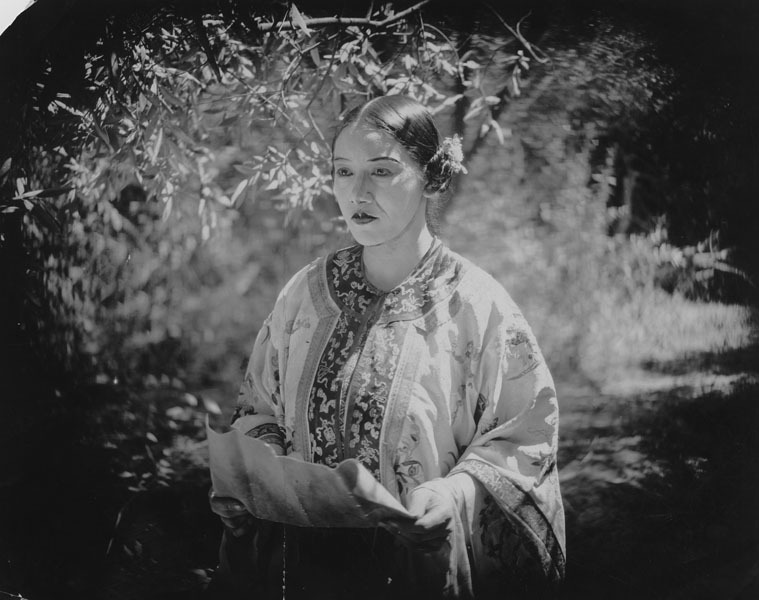 This is a photo still of Lady Tsen Mei as Moy Tai from the film, Lotus Blossom (1921), filmed at the former Bernstein Film Studio in Boyle Heights. Courtesy of the Los Angeles Herald Examiner photo collection, Los Angeles Public Library. Looking back at the cast and crew members involved in the making of Lotus Blossom, the level of experienced talent the Wah Ming Motion Picture Company was able to gather together on the Boyle Heights set is quite impressive. To begin with, the two screenwriters, Charles Furthman and George Yohalem, who adapted Leong's story idea, which was partially based on the Chinese fable, The Soul of the Great Bell, went on to enjoy some degree of success in the film industry. Furthman had his biggest success adapting the screenplay for director Josef von Sternberg's silent film classic, Underwold (1929), considered the first great Hollywood gangster film. His brother was Jules Furthman, a 1935 Oscar nominee for Mutiny on the Bounty, who enjoyed a long career of his own as a screenwriter. George Yohlalem, a sort of jack-of-all-trades, was a veteran of the film industry, whose career lasted well into the 1950s. One of his last credits was production supervisor for Fritz Lang's While the City Sleeps (1956). 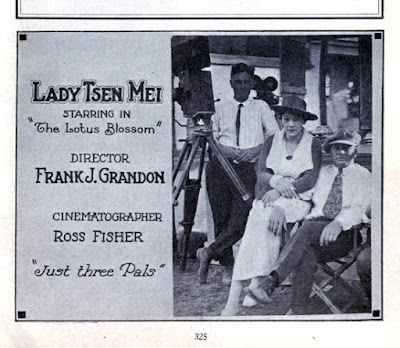 In a 1921 industry directory handbook, a photo can be found of actress Lady Tsen Mei, the film's director, Frank J. Grandon, and cinematographer Ross Fisher, posing together for a photo on the set. Grandon started his career as an actor. His most prominent role as Felipe opposite Lillian Gish's title character in D. W. Griffith's Ramona (1910), the first film version of the Helen Hunt Jackson novel. He switched to directing in 1916 and continued to helm films until he died in Los Angeles in 1929. Relaxing on the set of Lotus Blossom from left to right are, Ross Fisher, Lady Tsen Mei, and Frank J. Grandon. From The Motion Picture Studio Directory Trade Annual of 1921, Courtesy of the Internet Archive collection. Cinematographer Ross Fisher went on to enjoy one of the most distinguished and important careers in the history of cinema. Born in Springfield, Montana in 1887, Fisher was the cameraman on many early Hollywood films before moving to Mexico in 1931. He worked as the principal or co-cinematographer on numerous beautifully-shot black and white Mexican films of all genres during a period often referred to as “the golden age of Mexican cinema.” In addition to working with such legendary actors as, Pedro Infante, Jorge Negrete, Pedro Armendariz, and Lupe Velez, Fisher worked with famed director Fernando de Fuentes. Fisher was also the cameraman for the first Mexican color feature film, Novillero (1937), using his Cinecolor processing method. A few months after production on Lotus Blossom wrapped, film distributors and exhibitors began to publicize the availability of theater screenings for the movie in various industry magazines, some with large picturesque ads. The November 5, 1921 issue of Exhibitors Herald actually showcased the film with a two-page spread that included one page dedicated to nine photos from the film and the second page containing three brief movie reviews. All are glowingly positive. Perhaps to assist in giving it more box-office appeal and meet public expectations, the film also featured two white actors: Tully Marshall and Noah Beery. Both were made up heavily to look Chinese for two of the film's prominent roles, that of Moy Tai's father and a Tartar chief, respectively. Beery was the older borther of Wallace Beery, the Academy Award-winning actor for 1931's The Champ. He enjoyed a steady career as a working actor until his sudden death at his brother's home in 1946. Marshall, who made his first film in 1914, also had a consistent presence in films as a character actor. His last and one of his best-known performances was as the wheelchair-bound criminal mastermind in the noir classic, This Gun for Hire (1942), starring Alan Ladd. With pre-release advertising and promotion efforts handled, it was time for Lotus Blossom to make history as the first Chinese-American film to be played in theaters. More on that and further history on this ground-breaking movie in the third and final part of this post!